This documentation is a work in progress. It describes prerelease software, and is subject to change. This page takes you through the tools you can use to measure your application’s performance. Push critical resources for the initial URL route. This is achieved by using HTTP2 push, and covered in the Building and Deploying section. Render initial route. In order to get render the requested page as quickly as possible, each route should only load exactly what it needs, and not any resources that are needed by other, yet un-requested parts of the app. Pre-cache remaining routes. Once the requested page has loaded, a Service Worker will be installed and it will pre-cache the fragments specified in your polymer.json. Lazy-load and create remaining routes on demand. When the user switches routes, the app lazy-loads any required resources that haven’t been cached yet by the Service Worker, and creates the views. If a route is connected to the Redux store, since it is lazy-loaded, then its reducers must be as well. The Redux and state management page covers how to set up your store to accommodate lazy loading reducers, and gives you an example of how this is done in pwa-starter-kit. There are a few tools to help you measure and automate your performance measurements. WebPageTest is an application that loads your page on an actual Moto G4 device with a slow 3G connection, and then gives you a details report on the page’s load performance in that scenario. 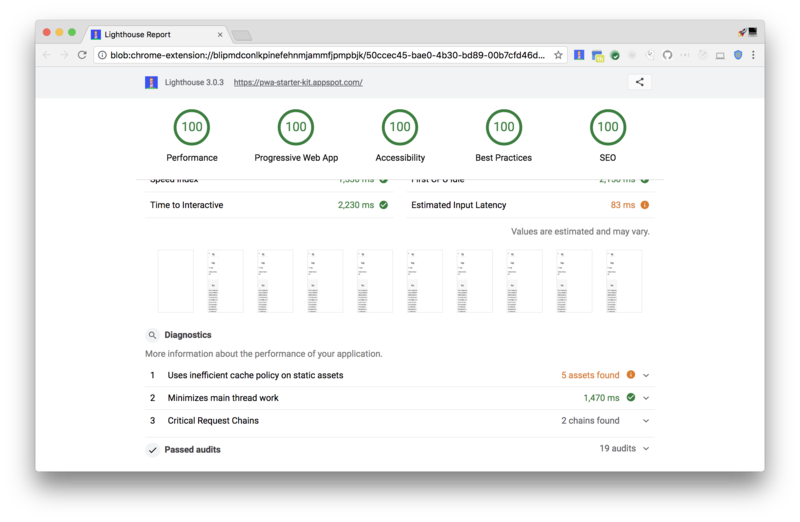 It is very useful to see how your application performs in a real-world, non-testing environment. For example here is a run testing the deployed pwa-starter-kit.